Charming family property dating from the 15th century and rebuilt in the 18th century, in a green setting in a valley. The main house surrounded by moats has a large kitchen, a library, a lounge, a large living room and dining room. The whole is bathed in light, with every room, a fireplace above which large windows allow great views of a 7-hectare park. 1st floor, 3 large bedrooms with fireplace and two large windows each, and a smaller room; 3 modern and comfortable bathroom. This entire house was restored in 2011. Charming family property dating the 15th century and Reshaped in 18th century, in a green setting in the hollow of a valley. The main house Surrounded with staves (Moats): has a great wide kitchen, a library, a sitting room, a big lounge and a dining room. The rooms are bathed by light, with in every room, a fireplace qui Above the big plate glass windows allow a magnificent view on a park. On the 1st floor, 3 very big rooms with fireplace and 2 big windows each, and a smaller room; 2 modern and comfortable bathrooms. This whole house was restored in 2011. This house is in our family for 3 centuries ..... its charm, its character and its renovation make a wonderful place of relaxation and great shared family time. This property is in the entrance of a flowery, protected village, with a homogeneous housing environment dating the 18th century. The peace of the park, the magnificence of the nature, the strength of trees, the sweetness of the hilly reliefs call strolls and heat of the colors of the rooms of the house, the family strong moments around a fire. The bedding is new and very comfortable as bathrooms. Fireplaces work. We were warmly welcomed by Mme. Gay de Tailly and given a tour of the impressive gardens and chateau. She also familiarised us with the workings of the swimming pool and appliances in the house. The gardens are idyllic and contributed to a very luxurious holiday atmosphere. Mme. Gay de TaillyTailly also treated us to cocktails and champagne and told us about the house and it's history. The Meuse region is worth visiting; little towns such as Marville and Montmedie have a wealth of history and there are some nice eateries. Verdun is about 45 minutes by car. Our two young children (4 and 5 years) thoroughly enjoyed the swimming pool, the vastness of the gardens and climbing trees in a parc nearby. We visited two of the restaurants you recommended and they were very good, delicious food and friendly people. Thank you for that. For us it was a very nice week. Thank you for letting us stay in your beautiful house! 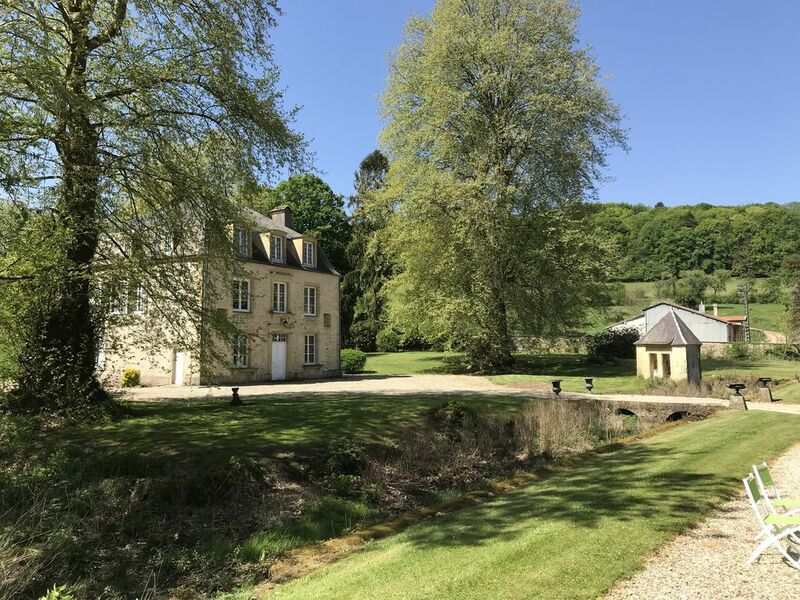 Very Nice old Chateau, in a quiet rural surroundings, situated in a beautiful park. The swimming pool is perfect and Marie was very hospitable and helpful! Thanks! Lovely time spent in Tailly! I stayed in Tailly for a week with my husband and we loved it! I didn't know this region of France and truly enjoyed the long walks, the quiet and beautiful countryside, the pool, the house, the park... I will definitely come back and recommend! Everything was clean, warm colours helped us feel at home along with the fireplace (I know we were in the middle of summer, but we love fireplaces!) and everything went well during our stay. A huge park comes with the house, it is perfectly maintained, and I was able to meet with the gardener with whom I practiced my poor French! 23°C, I swam everyday. My husband and I enjoyed sitting by the pool under the sun, reading on the deckchairs a good part of our stay! Marie welcomed us to give us a tour of the house and explain everything to us. We had a lovely time talking with her, she is from Paris and comes to Tailly every weekend to make sure everything goes perfectly for her guests. It is really nice, and I thank her for the great holidays we spent at her house. We had a wonderful holiday in Tailly! We were five (including three children, twins aged 11 and a 16 year-old). The owner Marie was extremely kind, very knowledgable and interesting to talk to and made sure that we had everything we needed. The house itself was amazing! it breathed history in every room but was nevertheless comfortable and had everything we needed. The house lies within a huge park, which really gives the impression of space and serenity - my husband went jogging around the grounds, it was that big... The only sounds are those if the small waterfall behind the house. The kids spent most of the time in the pool, which is very clean and big enough to play in with 5 people. - the supermarket is 15 minutes by car. it has everything one needs. the village also has a few bakeries (some of which are closed in the summer) and a butcher (who is also closed for 3 weeks in the summer). - there is a bread van most mornings in the village at 8.30, no other shops though. - a lovely restaurant is about 15 minutes away, really nice people and the food you come looking for in the French countryside. - the nearest champagne winery we could find is near Reims, about 70 minutes by car. - Reims is lovely, with all the shops and sights. Verdun is also lovely and not just historically interesting, but much smaller. - lovey walks around Tailly. If you are looking for peace and quiet in beautiful surroundings, this is exactly it! We had an extremely relaxing and peaceful holiday and no-one wanted to leave. would definitely come back! rich in history; many monuments and memorials related to World Wars 2: Citadel Verdun, Sedan, Montmedy, trench bayonets, the way ladies, the American cemetery at Romagne sous Montfaucon. Region rich in history; Numerous monuments and commemorative locations relative to 2 world wars: citadel of Verdun, Sedan, Montmedy, the bayonets of trench, the "ladies of the way," the American cemetery of Romagne sous Montfaucon.